See more from this issue. 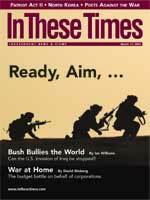 Enter your email address above to receive free email updates from In These Times editors. The country has been put on high alert, and I too have heightened my alertness—for balderdash masquerading as bald facts. I’d urge everyone to adopt the same attitude. We can start by going back for a more careful look at Secretary of State Colin Powell’s Security Council address on February 5, which pundits and politicians—and, according to a new poll, a majority of the American public—are calling a powerful argument for an assault on Iraq. Note the quotation marks. Like most Americans who read the brief summaries in the following day’s papers, I was amazed that an Iraqi officer had warned someone to “stop talking about it … they are listening,” since that in itself would be an admission of guilt to those very listeners. And, even more so, that he would say, “Don’t give any evidence that we have these horrible agents.” He sounds disgusted—and practically begging for an invasion to save the world and his own skin. I was about ready to suit up for battle myself, when I paused to double-check the transcripts of Powell’s talk for the exact language of the audio tapes. And that’s when double-check led to double-take. Because no Iraqi officer talked about “horrible agents.” Those were Colin Powell’s words. The secretary of state had simply taken the liberty to paraphrase what he believed the officers were implying in their conversation. He was putting words in their mouths. But the Slate summary, mailed to influential people all over the country, mixed up what the Iraqis had actually been heard saying with Powell’s tendentious paraphrase. CAPTAIN: I am with you, sir. COLONEL: Wherever it comes up. CAPTAIN: Wherever it comes up. COLONEL: In the wireless instructions. Let’s review a few selected items of this conversation. Two officers talking to each other on the radio want to make sure that nothing is misunderstood. … Why does he repeat it that way? Why is he so forceful, making sure this is understood, and why did he focus on wireless instructions? Because the senior officer is concerned that somebody might be listening. Well, somebody was. Nerve agents. Stop talking about it. They are listening to us. Don’t give any evidence that we have these horrible agents. After years of duplicity, Iraqi officials don’t have any credibility. The problem is, the arguments put forth by any party with a predetermined agenda must be viewed with skepticism. Powell’s totally fictional line about “horrible agents” may reflect the gist of the Iraqi’s actual words. Or there may be another explanation. We’re told that, in a translation of a conversation from a scratchy recording, some person whose identity we cannot know, referred to “nerve agents.” Assuming the tape is clear enough, and the translation correct, all we have is someone telling someone to remove a reference to nerve agents. And what kind of reference? We have no idea. Anything is possible. It could be an old reference, in an old manual, to nerve agents Iraq used to have. It could be instructions on what to do if confronted with nerve agents launched by enemy troops. It could be anything at all. It’s not that Saddam isn’t horrible, or that he doesn’t have some dangerous weapons. He probably does. It’s that the United States, despite all its high-tech intelligence-gathering, does not really know very much about Saddam’s capabilities and intentions. Instead of admitting that, which would undermine its case for a pre-emptive strike on oil-rich Iraq, the Bush administration is willing to twist the truth and pretend to know what it doesn’t know. History provides a chilling precedent. In 1964, President Lyndon Johnson strong-armed Congress into giving him a blank check for conducting the Vietnam War in the so-called Gulf of Tonkin Resolution. This resolution was based on a supposedly unprovoked attack on U.S. ships by North Vietnamese naval forces—an attack which almost certainly did not take place as Johnson described, and may not have happened at all. Nearly 40 years later, heightened alertness looks like a wise idea. Russ Baker is doing his own "monitoring" of events from his current perch in the Balkans. Show email | Remember me | Notify me if someone replies to this post? Tahks for the transcrips, for those of us that do not speak Iraqi, or have interpreters.